Hand-held, anti-aging device designed to diminish wrinkles and fight acne. Safe and easy to use at home, it combines ultrasound technology with wrinkle-repairing red LED and blue LED light therapy for control of breakouts and acne. 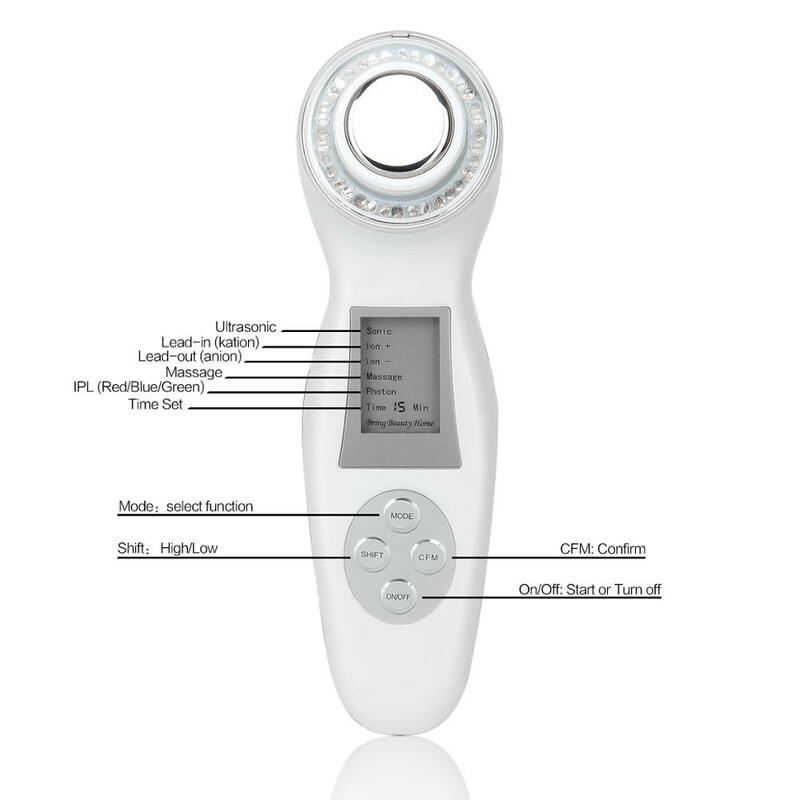 Unique 5-in-1 device will improve the skin’s natural collagen, minimize fine lines, reduce redness and broken veins, and destroy acne-inducing bacteria. The machine works by super-fast frequency, which will not see obvious vibration or heat up. You could try water drop experience to see its powerful function. ADVANCED DESIGN: Advanced and powerful advanced technology, which effectively restores the elasticity and shine of the skin, giving it ceramic skin. It can accelerate blood circulation and metabolism, improve skin pigmentation, and cleanse skin cells to eliminate unnecessary oil, tighten the skin of the face effectively. HIGH FREQUENCY VIBRATION: Up to 7,000 times of high frequency physical micro vibration per second, effectively tightens the eye bag, activates skin cells, promotes protein regeneration, eliminates wrinkles and improves sagging skin at the same time. 3MHZ: It is suitable for facial or body care of the skin. Ultrasound can penetrate the epidermis to reach the deep tissues, make the molecules of the product for skin care thin and accelerate absorption. LED THERAPY: Three colors, each light deals with different skin problems. Red LED focus on anti-wrinkle, enhance the collagen of the skin; Blue LED focus on acne treatment, kill bacteria; Green LED spotlight in balance and calm skin. 1. High-end LCD screen, visible operation. 3. 3MHz ultrasound, tighten skin and improve the absorption capacity of skin. 4. Ion+: clean skin thoroughly, ion-: nourish skin deeply. 5. 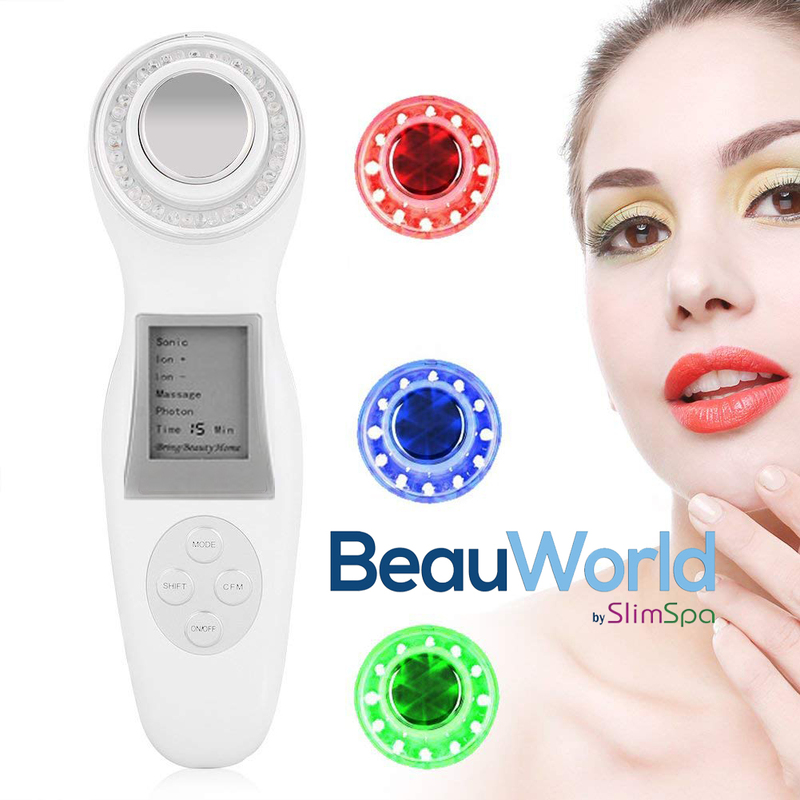 Red, blue & green lights for rejuvenating skin. 6. Blue light (wave length is around 465nm): anti-acne & rashes. 7. Green light (wave length is around 520nm): relax skin and reduce the pain of skin. 8. Red light (wave length is around 630nm): improve blood circulation, reduce wrinkles and smooth skin. 9. Vibration function for comfortable massage. Red (630 nm) --- One of the most powerful colors to increase blood circulation. Stimulate skin cells to excrete collagen to achieve firm and smooth texture. Blue (415 nm) ---Excellent effect of improve sensitive skin. It can adjust skin sebum secretion, effectively improve skin texture. Green (525 nm) ---Anti-aging, smooth wrinkle and fine lines, cure wounds. Meanwhile, calming the skin can make both body and skin relax, and reduce the pain of skin. Massages cells precisely, and rise temperature in deep skin, help promote absorption of essences, accelerate metabolism, reinforce the regenerative course of tissue. Also, the powerful ultrasound helps you lose weight and cultivate your figure. Positive ion & negative ion for skin lifting, tightening, deep cleansing etc. Vibrating massage improves blood circulation & slims skin. Improves blood circulation & slims skin. Ultrasound: 3 million sound waves per second, suitable for facial skin, eye skin, body skin care. Through high-speed vibration, heat and physicochemical action, it can give appropriate stimulation to skin cells, effectively help active cells and accelerate metabolism, enhance regenerative ability, and deeply activate skin, while helping positive ions and negative ions to be better exported. Introduced for all skin types. Physical massage: 6500-7000 physical vibrations per minute, can accelerate the blood circulation to take away melanin and excess water, and can eliminate the skin edema, with the ultrasound together, can achieve double firming and whitening effect. Positive ion: Using the characteristics of ionic charge and opposite phase attraction, the instrument forms a current loop in the palm and cleansing parts of the human body, and the dirt hidden deep in the pores is exported, completely removed, and you are clean and delicate like a newborn skin. . Negative ion: Using the characteristics of ionic charge and opposite phase repelling, the instrument creates a current loop between the palm and the skin care part, and introduces the nutrient and active ingredients of the skin care product into the deep layer of the skin to avoid isolation due to the natural barrier of the skin barrier layer.